Jive Recap – What’s Been Happening the Last Few Years? Already in 2012, Pokeshot///SMZ was an official Technology Sponsor of JiveWorld. The collaboration was soon expanded, so that in February 2013 Pokeshot///SMZ became an official Jive Technology Partner and in April of the same year, a Consulting and Professional Service Partner. In addition to consulting, professional services played a particularly big role in 2013. 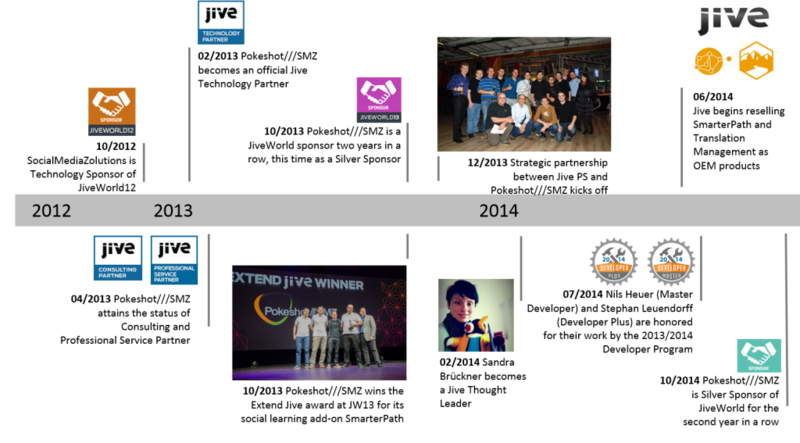 At the end of the same year Pokeshot///SMZ also entered into a strategic partnership with Jive Professional Service. The extent to which Pokeshot///SMZ has changed in the last few years can also be seen in the increased number of staff members. For example, joining the company in 2013 was the social business strategy consultant Sandra Brückner, who already in February 2014 was named a Jive Thought Leader. Jive also honored the work of managing partner Nils Heuer and enterprise architect Stephan Leuendorff, conferring on them the distinction of Jive Master Developer and Jive Developer Plus respectively. Every year since 2012, Pokeshot///SMZ has been a sponsor of JiveWorld, the world’s biggest and best social business conference. Since 2013 it has also served as a Jive Silver Sponsor of the conference. Pokeshot///SMZ also celebrated a major success at JiveWorld13 on the strength of its social learning management solution SmarterPath – this add-on won the 2013 Jive Award in the Extend Jive category.